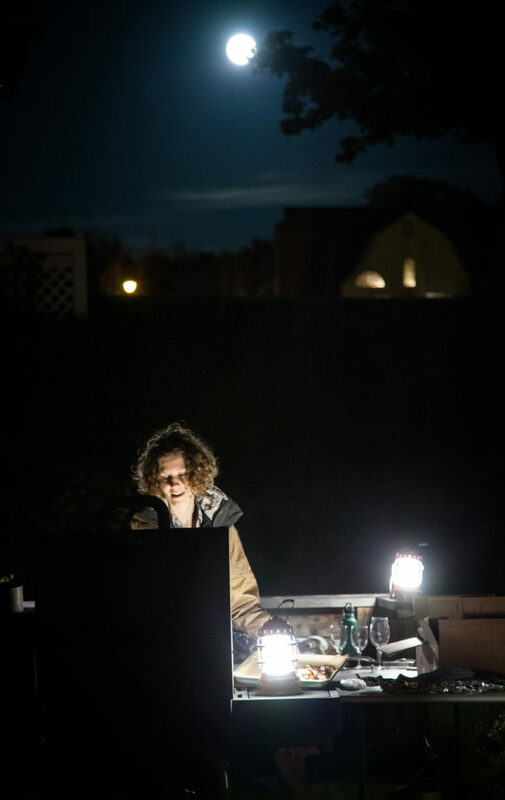 Recently, I had the opportunity to do a behind-the-scenes interview with the Adventure Sports Network on writing Feast By Firelight. I wanted to share a snippet from their recent article ‘Feast by Firelight’ Could be the Best Camping Cookbook, Ever, AND, an exclusive recipe that was originally included in the book. My recipe for Rosemary-Balsamic Grilled Chicken was one of several we ended up cutting to make the book more portable for all your adventures, even if only to the backyard. I hope this stokes your culinary fire – grilling season is still at its peak with all the fall bounty! 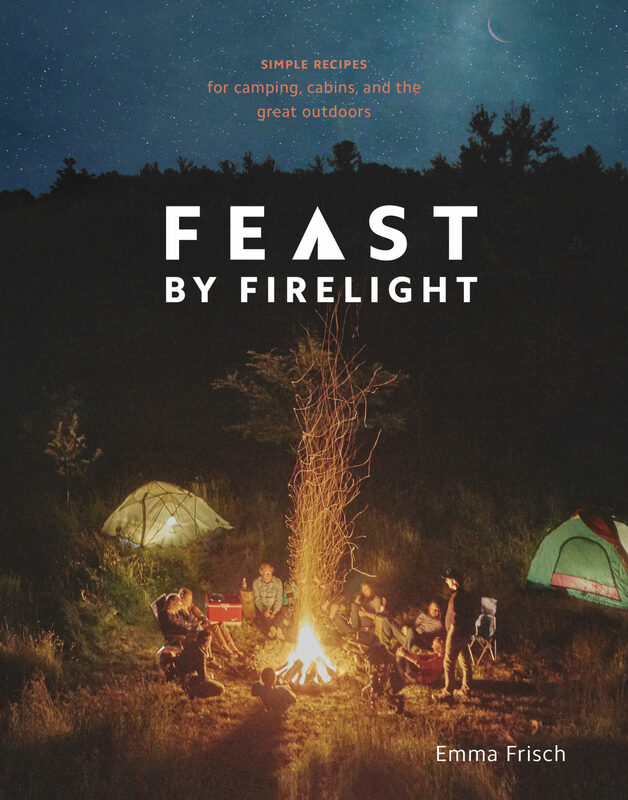 ‘Feast by Firelight’ is one of the most useful and complete camp cookbooks we’ve ever had the pleasure of reading. When did you decide to impart your wisdom on the masses and what was the process of putting that book together? I’m honored you think so! The original idea for the book was more focused on open fire cooking with wild foraged foods, but when my editor and I started researching the camp cookbook category, we found a major void. Most camp cookbooks featured a limited number of recipes that relied heavily on processed and prepackaged foods, or were geared towards backcountry cooking, which requires using lightweight, dehydrated ingredients. What’s more, we were hard-pressed to find a camp cookbook with vibrant photography that could bring the essence of cooking and playing outside to life. When you look at the camping industry in America, the grand majority go car camping. 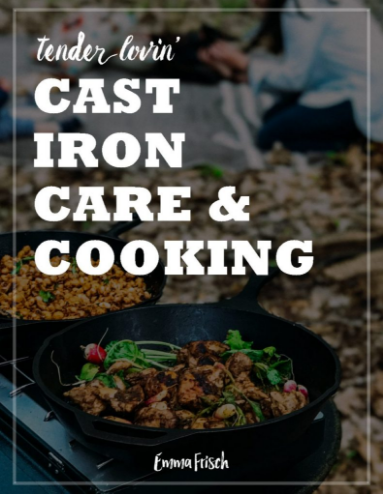 This means that they can pack a cooler with some fresh ingredients as well as cooking equipment (like a cast iron pan), that together, lend to creating simple, easy, mouthwatering meals outside. 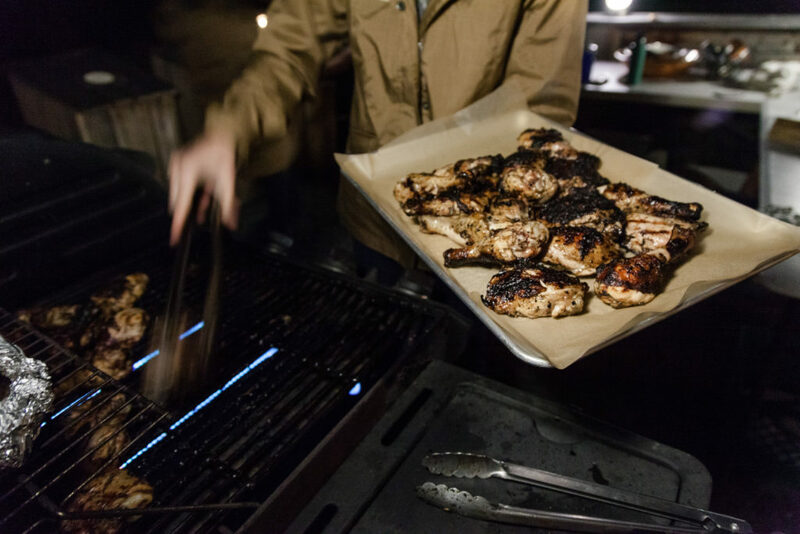 As a former backcountry guide, car and festival camper, and now culinary director of my glamping hotel, Firelight Camps, I was excited to bring my own experience and knowledge to others by attempting to create a foolproof camp cooking guide. The hardest part about writing a camp cookbook is that cooking outdoors can be so unpredictable! And yet, with a cookbook recipe, readers want the author to hold their hand each step of the way, yielding predictable, perfect results. So part of the challenge I faced was how to effectively communicate what variables to expect when cooking outside, while also empowering readers to embrace those uncertainties and use them as an opportunity to tune into their senses and intuition. For example, testing the heat of burning coals or staying close to the cornbread so one can smell when it’s ready. 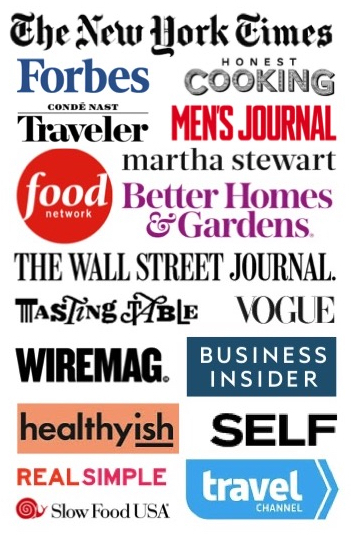 I made nearly all the recipes adaptable for the home kitchen as well, so readers could experiment at home and gain confidence before taking them outside… Read the complete interview here. Get the Feast by Firelight cookbook today (and another sneak peek recipe here)! It was a real scorcher the day Ten Speed Press sent me the offer for this book, and I couldn't wait to get down to East Shore Park with Ayla to celebrate and cool down in Cayuga Lake. The shorefront throbs with sunbathers all summer, emptying only after the sunset. I found myself drawn towards the grill, curious to see what smelled so good. A tall man in swim shorts was bobbing to the beats coming from his portable speakers, rhythmically turning something with long tongs. We watched the smoke spiral up into the still air. My mouth started to water. "Watcha making? It smells soooo good!" I said, my voice almost squeaking with excitement. He raised his shades and scoped us out. "Cute baby," he said. "Thanks!" I replied. "I'm writing a cookbook about camp food. I'd love to know what you're cooking." He offered, "You wanna try some?" I was too shy to take a bite, but he let me in on the main ingredients in his marinade: rosemary, balsamic, and garlic. We dashed back home to make our own variation, only stopping to pick up chicken. 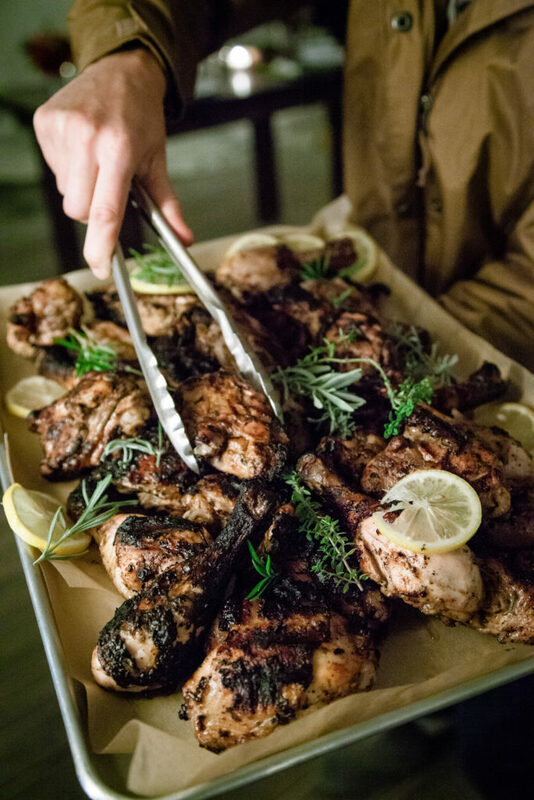 Thank you, Mr. Griller, for your juicy, tender and flavorful grilled chicken! Place the chicken thighs in a Ziploc bag. Put everything else in a blender and puree until smooth. Pour the marinade over the chicken and seal. Shake the bag so the marinade coats all the chicken. Refrigerate until ready to transport to camp. 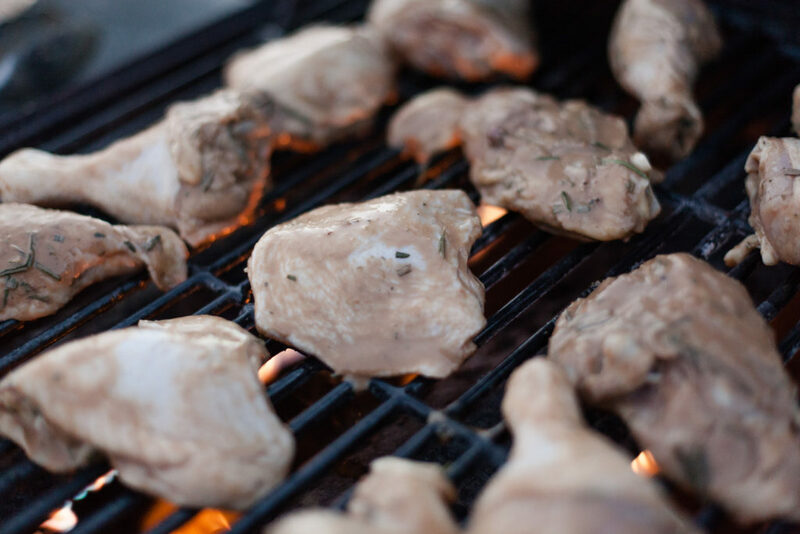 Chicken thighs, juicy and dark, are the most affordable and forgiving cut of chicken for cooking on the grill. The longer you let them marinate, the better the final dish!